Luxurious and sporty, the 2017 Chrysler 300 is a sedan that has a manufacturer’s suggested retail price (MSRP) of just above $32,000. An upgrade to the 300S or 300C costs well over $35,000. As the most advanced model in the lineup, the 300C Platinum carries a price tag that exceeds $42,000. For approximately $3,000, this trim can be equipped with the SafetyTec Plus Group, which includes accident-avoidance technology. The powertrain options for the Chrysler 300 include the Pentastar V6 engine and HEMI V8 engine. As a premium sedan, this model offers all-wheel drive for reliable handling on any road. Featuring eight speeds and the Sport Mode, the TorqueFlite automatic transmission is another high-performance installation that’s designed for thrilling rides. In the exterior styling category, the Chrysler 300 is available in Redline Red, Jazz Blue, Maximum Steel, and other attractive colors. Genuine Nappa leather with stitches and perforations is available for the car’s climate-controlled seats. Natural wood grain, nickel trims and an analog clock add a sophisticated touch to the spacious cabin. When you open the hood of the Chrysler 300, you’ll see the 3.6 L V6 Pentastar engine. 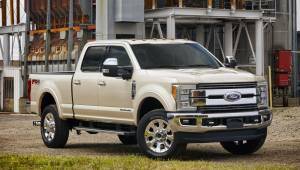 Running on the Variable Valve Timing (VVT) cycle, this six-cylinder engine is capable of whipping out up to 292 horsepower and 260 pound-feet of torque. An electronic throttle control is also integrated into this legendary powertrain. The intake and exhaust valves are designed to handle high-flow combustion. If you need easy access to more than 360 hp, then select the optional 5.7 L HEMI V8 engine that supports a top track speed of 160 MPH. In addition to having the VVT technology, this massive eight-cylinder engine includes a multi-displacement system (MDS) that precisely controls the power stroke. A 180-amp alternator and 730-amp battery with a maintenance-free design are some other notable installations in the Chrysler 300. This Chrysler sedan is equipped with the TorqueFlite automatic transmission system that has eight speeds. Changing gears requires a simple turn of an electronic rotary dial that’s easier to handle than a traditional shift lever. This signature transmission smoothly distributes torque to a conventional rear-wheel drive or an all-wheel drive. Offering slight leverage and correctional input, an electric power steering system delivers responsive handling on any road. When the Sport Mode is turned on, the vehicle can pull off swift maneuvers in challenging conditions. This mode makes the accelerator more responsive to the slightest depression of your foot. The Hill Start Assist and Electronic Roll Mitigation stabilize this car on sloped roads. When you’re driving on wet or rough surfaces, additional support is provided by the Electronic Stability Control. Based on EPA standards, the Chrysler 300’s Pentastar engine offers up to 30 MPG on the highway and 23 MPG in the city. The HEMI engine is rated at 25 MPG on the highway and 16 MPG on urban roads. Thanks to the Fuel Saver technology, this V8 engine is able to achieve relatively impressive fuel economy. An 18.5-gallon fuel tank that’s filled with regular or premium gasoline supports a nonstop driving range of approximately 555 miles. 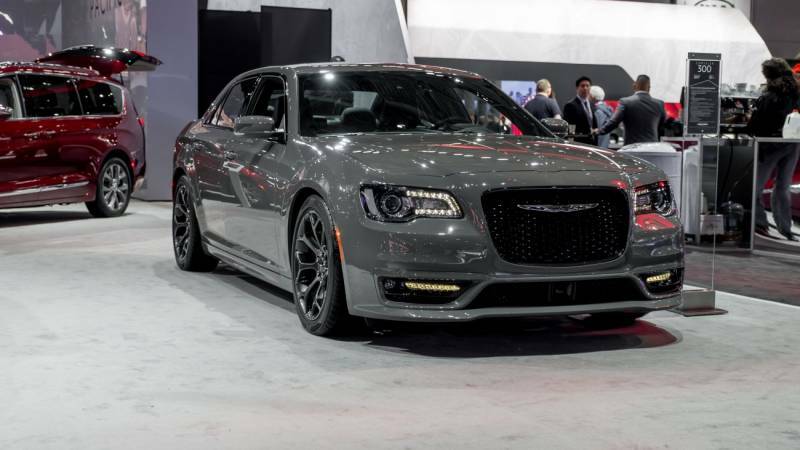 A curb weight of slightly more than 4,000 pounds affects the overall efficiency of this luxurious Chrysler sedan. Keep in mind that some compact sedans weigh up to 1,000 pounds less than this model. An 8.4-inch display with a touch-screen design is at your fingertips in the Chrysler 300. Powered by the Uconnect suite, the infotainment system has a GPS navigation system that delivers excellent guidance. SiriusXM Traffic also offers real-time updates on local roads. From gas prices to weather forecasts, SiriusXM Travel Link provides other helpful information on the go. The Uconnect system includes a five-year subscription to these premium data services. With the SiriusXM Guardian service, you can remotely manage and control the vehicle. With more than 130 music channels to choose from on SiriusXM Satellite Radio, and plenty of other stations on HD Radio, your trip in the Chrysler 300 won’t be boring. The optional BeatsAudio system includes 10 premium speakers that play music in clear quality. This signature sound system has a digital amplifier that generates more than 550 watts of acoustic power. Installed inside of the trunk, a powerful subwoofer also enhances the audio quality for the rear passengers. The media hub in this lavish sedan includes dual USB ports, auxiliary jack, and wireless charging station for compatible gadgets. Apple CarPlay and Android Auto provide convenient ways to connect smartphones with the Uconnect system. You may also turn on wireless Bluetooth to link other types of mobile phones with the sound system. When the Chrysler 300 is at a high risk of crashing into another car that’s ahead, the Full-Speed Forward Collision Warning comes on. The Active Braking automatically applies the brakes to mitigate the severity of a high-speed crash, or perhaps prevent one. An automatic braking function is also integrated into the Adaptive Cruise Control, which precisely monitors the distance to another vehicle that’s in front. This dynamic cruise control system can automatically stop and restart itself. With some help from the Lane Departure Warning and Lane Keep Assist, you’ll stay on the right track. Powered by the LaneSense technology, these features react to the slightest drifting out of a single lane. Designed to lower the risk of a side collision, the Blind Spot Monitoring System also improves your awareness on a multi-lane highway. 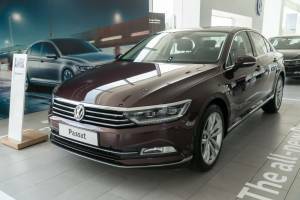 Other accident-mitigation features in this luxurious sedan include the ParkSense Front and Rear Park Assist and Rear Cross Path Detection. Capturing a wide-angle video with colored grid lines, the ParkView camera also offers good guidance for backing up. With a starting price of just above $34,000, the 2017 Cadillac ATS is on the same luxury level as the Chrysler 300. This Cadillac sedan runs on a turbocharged 2.0 L engine or a 3.6 L V6 engine. However, both of these engines surely can’t compete with the capabilities of the HEMI V8 engine. When equipped with a limited-slip rear differential and the Magnetic Ride Control, the ATS offers better handling than the Chrysler 300. The ZF steering system and Brembo front brakes also highlight the superb performance of this sporty Cadillac model. Featuring navigation, Android Auto and Apple CarPlay, the Cadillac User Experience (CUE) system is similar to the Uconnect system. A 4G LTE Wi-Fi connection is also included in the CUE platform. Available with the Driver Awareness Package and Driver Assistance Package, the ATS matches the active safety features of the Chrysler 300. However, the head-up display (HUD) and Safety Alert Seat give this Cadillac a slight edge in the safety category. Christopher Lyzcen / Shutterstock, Inc.